Article written by Aimee Hicks and Ellys Cartin. Edited by Donna Cromeans (@DJRiter). Article prepared for publication by Aimee Hicks. This is Alycia Debnam-Carey's fourth Performer of the Month win. She also remains the only performer to ever win this recognition for two separate characters on two different shows. It is a testament to her acting prowess that any character she is entrusted with always becomes a runaway hit on the show. She is a powerhouse actress who somehow turns every role she takes into something special. She is the sort of actress that writers can hand a character and know, without a doubt, that she will make the character better than their wildest dreams. This is a fact not lost on fans who loyally follow her from one project to another because they know she won't disappoint them. Fear The Walking Dead quite literally won the casting lottery when they landed her to play Alicia Clark. Throughout the four-year run of Fear The Walking Dead, Debnam-Carey has proven herself a formidable force. Her time as Lexa on CW's The 100 showcased how physical and fierce she is, but the character of Alicia has given her many more opportunities to shine, showing the world just how powerful of an actress she is. This show has quite literally thrown everything imaginable at her and she's never faltered in her delivery with memorable and emotionally deep performances. That was the case with Close Your Eyes (4x10) where they gave her an entire episode to shoulder, with just a single co-star. What she crafted along with Alexa Nisenson (Charlie) will be remembered as one of the most powerful episodes of the series. Debnam-Carey led the way and her performance was profound and thought-provoking in addition to extremely emotional. These are the reasons why Alycia Debnam-Carey is such a deserving winner of the title of SpoilerTV's Readers’ Choice August Performer of the Month. It is a well-deserved win for this actress who is in a category all her own. In Close Your Eyes, after failing to save someone in distress in the previous episode, Alicia sets off on her own into the growing storm. She finds a house where she can hide, unaware of the demons and ghosts waiting for her inside. Alycia Debnam-Carey's approach to this scene establishes the emotional foundation of the episode. There is no urgency in her movements. She enters the house slowly, almost tiptoeing reverently down the hallway, with the stillness of a reluctant intruder. When she calls out to ask if anybody is home, it comes across as a reflex. So does stopping the undead man who shuffles to meet her when she enters the kitchen. As Alicia drags his body toward a side door, she hears another undead. But this time she freezes. Debnam-Carey only had a second, perhaps, to translate this for us. Horrified eyes followed by teeth gritted in anger with a powerful swing of the arm to make the killing blow. It doesn’t go unnoticed how much the undead woman resembled Alicia's mother Madison if it weren't for that reaction. The swing is too powerful, and Alicia has to improvise to kill the younger undead woman who stumbles over next. Debnam-Carey doesn't look at the bodies as they fall, opting instead to have Alicia pause for a moment, her expression unreadable but an awareness in her eyes of the tragedy her character has discovered in this house. There is one more undead: a young man. Alycia Debnam-Carey does something here that is familiar to Fear The Walking Dead fans, her shoulders drop, and she exhales, releasing a shaky sigh of pity. Father. Mother. Son. Daughter. It's as if Alicia has metaphorically killed her entire family. She stands in front of this family's photo above their fireplace, staring at it. There is absolutely no indication what she is thinking or feeling, but Debnam-Carey's gaze cuts through the camera as if her eyes are looking at something that is both very close and very far away all at once. She does not blink. It's impossible to blink while watching her. After knocking the picture down, Alicia cleans her weapon, but her mind is elsewhere as her eyes continue their blank stare. She avoids her own reflection in the mirror when going to clean the mud off her face, but another wall of family pictures persecutes her. Alicia dumps them in a laundry basket and deposits them outside next to the bodies. Even here Debnam-Carey restrains Alicia emotionally, having her barely plunk the basket down. She is silent, merely going through the motions. Everything is upended when Alicia hears a noise upstairs and discovers Charlie. For every second building up to this, Debnam-Carey has Alicia move slowly and precisely. The moment Alicia sees Charlie everything unravels. She quickens Alicia's breathing, has her literally shaking with panic, and carries her out of the house so fast she is almost throwing herself back out into the storm. The car door is stuck. She ditches her bag of supplies and grabs the top of the door with both hands, screaming in frustration as it won't budge. After being knocked out by a forceful wind, Alicia wakes up back in the house. She knows where she is at once, but Debnam-Carey walks us through Alicia's mental process by having her first look at the open cans of food set out for her then reach for her weapon, only to hesitate when she sees a cup of tea sitting there. She tells us with these small gestures that this demonstration of care is what pushes Alicia nearly to her breaking point. The next scene consists solely of Debnam-Carey acting opposite a door. The door is dividing Charlie and Alicia, but it's the only immediate audience the actress had at the moment. And she gives it hell. First, she screams at it and pounds on it, demanding answers. 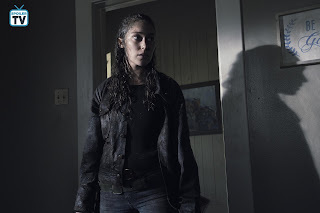 Then Debnam-Carey steps up close to it, focusing every ounce of her being on channeling bitterness and sorrow and rage through the tiny gap where the door meets the frame. Frigid hostility condenses into grief, as Alicia tells Charlie the story of her brother's horrific last moments. The drip of vulnerability that comes with remembering this dries up quickly, as Debnam-Carey changes her character's tone again letting the anger spill out. Then she has Alicia pause, step back from the door, and look away. She purses her lips as if Alicia isn't sure if she should say anything else. When she speaks again, it's to let Alicia be honest with Charlie, to confess she doesn't know if she wants to kill Charlie, but she thinks she will if they are trapped in the house together. Debnam-Carey doesn't let everything out at that moment, she has Alicia compose herself and issue some corpse cold declarations to Charlie. "You know what you did and that makes you garbage." Even as such acidic words come out of Alicia's mouth, Debnam-Carey inserts almost imperceptible pauses into Alicia's tongue lashing. These pauses create the effect that these sentences don't come naturally, that she is choosing to say them because she feels she has to. Debnam-Carey portrays Alicia in such a way that her emotional pain and anger are palpable. Alicia needed this release of anger and for Charlie's sake it was best that Alicia's rage was taken out on the door. Alicia was out to hurt Charlie and her words hit home. Debnam-Carey's line delivery here was visceral and full of raw emotion. Alicia's words were sharper than the sharpest dagger, but what Charlie couldn't see was Alicia trembling with conflicting emotions and the occasional tear that escaped and trickled down her cheek as she remembered all that Charlie took from her. The fact that Debnam-Carey spoke with so much anger in her voice yet showed Alicia so troubled by the entire situation was a powerful and profound moment of acting. She showed that the need for vengeance was at war with Alicia's humanity. Debnam-Carey had to yo-yo her performance through this entire episode. Charlie does something, and Alicia loses her composure a little bit more each time. She always pulls herself back though, slipping into a trance, like she's looking at that family picture again. This happens when she finds that Charlie covered the bodies and retrieved the photos. It happens when she finds the gun on Charlie, the same gun that was used on Nick, and yet again when she prevents Charlie from committing suicide. After this last incident, Debnam-Carey ever so slightly brings Alicia back to life by having her finally make lasting eye contact with Charlie. She dumps some hard facts on Charlie, they will both have to live with the things they have done. However, there are no good reasons to keep going and Charlie isn't going to get what she's looking for from Alicia. They sit down to a meal, and Alicia tries to slip back inside her own head, but Charlie has decided to start talking, pestering her with questions about life in California and what the beach is like. At first, as they sit eating dinner, Debnam-Carey intensely chews every bite, scooping up big spoonfuls. As Charlie keeps talking, Alicia chews slower and takes smaller bites, an effective way for Debnam-Carey to show that Alicia's attempts to ignore Charlie are failing. The more time they spent together the harder it became for Alicia to completely write-off Charlie as “garbage”. She was still cross with Charlie as she cleared off the table and ordered the girl to get some sleep. However, thanks to Debnam-Carey’s brilliant acting the moment didn’t play as angry. It was clear that Alicia was mentally and physically exhausted, but she needed to see Charlie to sleep first. She needed to know that her young companion was taken care of before she could settle in to try to get some rest. This is where her protectiveness of Charlie really began to shine through. It was clear that Alicia was starting to care despite her best efforts to do just the opposite. The internal battle played all over Alicia’s face and Debnam-Carey made sure that the audience was able to palpably feel the struggle. It was very evident that caring about Charlie’s well-being was not something she was comfortable with. She was still trying to reconcile the troubled girl in front of her who was in need of guidance with the person who destroyed her family. Debnam-Carey made all of this work. It was in the subtle ways she had Alicia pull back and try to take charge versus continuing to punish Charlie. Thanks to some very precise acting and unprecedented control over her emotions, she was able to show Alicia's gradual softening even when her spoken words were still at times harsh and pointed. The changeover to protector was extremely evident when Alicia woke-up to find Charlie missing. Debnam-Carey chose to have this very brief flash of worry pass over Alicia’s face. She immediately took action to find Charlie, when Alicia finally found her the reaction she had was of fearful anger, but not the same sort of anger from earlier in the episode. This was the sort of anger that happens when a person does something that scares a loved one. Debnam-Carey played the two variations of anger just different enough that it was crystal clear that this was different than earlier. It was masterfully acted for maximum impact on the audience. When Charlie declared that she accepted Alicia’s claim that she was “garbage” it stopped Alicia in her tracks. Debnam-Carey allowed those words to hit Alicia hard. She had meant the declaration when she made it, but hearing it thrown back at her made her realize the impact her words had on Charlie. At that moment, Debnam-Carey turned off the anger and pulled Alicia back into a calmer frame of mind. She was still harsh in her words, but they weren’t meant to hurt this time. They were meant as a firm dose of reality. Somehow, through this clash of differences, the two women actually began to find some common ground as was evident in the way Debnam-Carey had Alicia deal with Charlie after this encounter. Alicia was delivering the harsh truth to Charlie, but the acting choices Debnam-Carey made showed that their discussion over the photos was more Alicia trying to educate Charlie to the world they now live in versus trying to punish her. She was almost like a mentor trying to get a message through to a stubborn teenager. There was a softness in her voice that even Charlie picked up on and when Charlie asked why Alicia cared there was this taken aback look on her face like Alicia herself didn't even have an answer to that question. Debnam-Carey subtly showed how startled Alicia was not just at the question, but at the realization that without really realizing it she had indeed begun to care. No response was needed because in the very next second they were in peril and Alicia's first reaction was to protect Charlie and get her to safety. Then they were in the basement and what took place in that room may very well go down as the best tour-de-force performance Debnam-Carey has delivered to date on this show. It was on a whole other level that exceeded even her own prior bests. This scene provided yet another example of why her character is such an integral part of the very essence of this series. The entire episode Alicia has been restraining herself from ending Charlie and here she is as the sole protector of this scared child. Ultimately she decided to take the high road and prove that she is indeed her mother's daughter as she chose to fight to save the life of a person who she had spent a considerable amount of time hating. She is fighting to save what is left of her soul by saving Charlie. 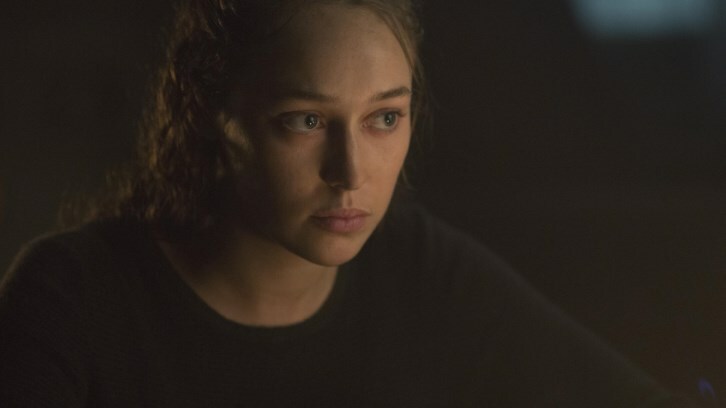 One of the most integral aspects of Debnam-Carey's performance throughout the hour is that she showed a softening in Alicia's eyes as the character began to better understand Charlie. That singular choice played heavily into why this new role of protector didn't feel forced. When Alicia acted on her responsibility as Charlie's protector it wasn't something that she or the audience really expected, but the way Debnam-Carey played all of Alicia's interactions with Charlie made the changed dynamic between them feel organic and earned. When Alicia was knocked back, during the building collapse, she slammed into Charlie thrusting them both back into the water. She came up first and immediately started to assess the situation, knowing they were in trouble. The look on Debnam-Carey's face was one of pure terror as Alicia realized how dire was the state of their situation. When Charlie surfaced she was careful to not look at her until she could get her thoughts together on their predicament. She masterfully controlled every tiny expression at this moment. When she finally allowed Alicia to look at Charlie, there was a very different expression on her face. Alicia's face still expressed concern, but the fearful look was gone. She was in survival mode and wasn't going to let anything happen to Charlie despite their sordid shared past. Throughout the whole aftermath of being trapped Debnam-Carey did these flips. When Alicia was facing away from Charlie there was a fearful look on her face and an almost frantic appearance to her actions, but the moment she was face-to-face with Charlie she was in control. The sheer amount of concentration and planning this took on the part of Debnam-Carey had to be exhausting. To further complicate everything, both Debnam-Carey and Nisenson were stuck acting in a water tank set. They were undoubtedly well cared for, but in the process of filming these scenes, Debnam-Carey likely had to look after Nisenson every bit as much as Alicia was looking after Charlie. She was careful to keep a cautious protective eye on Nisenson whenever possible. There were moments where the care and consideration for Charlie were so strong that it was hard to tell if it was Alicia the character or Alycia the actress in the moment. It is a testament to both actresses that this episode worked so well. They played off each other brilliantly and the environment and subject matter of this episode required a massive amount of trust between the two actresses. That needed trust was perhaps never more important than at the moment where Charlie begged Alicia to shoot her because she didn't want to end up as one of the undead. Keep in mind, that at the top of the hour Charlie was someone that Alicia was fighting every urge in her body to not kill. Despite everything, Charlie is still just a kid and Alicia simply doesn't have it in her to condemn a child despite the horrible things this child inflicted upon her family. This is why Alicia and the audience were caught so off guard by the fact that Alicia fought Charlie so adamantly after the request was made. For the first time since they were trapped, Alicia's fear was on full display for Charlie to see and it had nothing to do with being trapped. Through Debnam-Carey's masterful acting it was so very clear that Alicia was more terrified of taking the life of this child than dealing with drowning or the hordes of undead outside. She took Alicia into an instant state of shock at the prospect of this young girl making this request. She was soaking wet and water was dripping all over her, but it was clear that there were tears streaming down her face at moments in this emotionally charged scene. 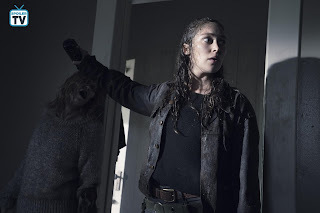 Debnam-Carey is fierce in fight sequences and she can be quite funny in lighter moments, but it is in these deeply emotional moments where her true acting prowess is put on display. As Charlie was making her case for Alicia to shoot her she was intentionally egging on Alicia. She wanted to provoke Alicia's inner turmoil and force the other woman to give in to her desire to end the person who destroyed her family. The entire time Charlie was going on, Alicia was fighting to not take the bait. Debnam-Carey shakes her head and clenches her jaw as she adamantly has Alicia try to fend off Charlie's request. Her chin quivered despite her best efforts to show strength in this horrendous situation and her body is visibly shaking as her adrenaline spiked at the request. Debnam-Carey then brought Alicia under control. She had Alicia take calming breaths and look very intently at Charlie. It was clear through the actress exactly what was going on in Alicia's head. One could almost hear the internal monologue in Alicia's head as she tried to justify obliging Charlie's request. She forced herself to stop seeing the child before her and see the person who destroyed her family and that gave her the strength to lift the gun to Charlie's head. Then the audience and Charlie were left in limbo as a war raged within Alicia over what to do. This is the moment where Debnam-Carey delivered what may very well be the most profoundly defining bit of acting of her career. She allowed her character only a moment of steadiness before she had Alicia nearly hyperventilate over what was happening. With a shaky hand and rapid panicked breathing, Debnam-Carey closed her eyes as Alicia remembered her brother and mom. There was this expression on her face that wasn't quite a smile but was a look of fond remembrance despite what she was remembering. 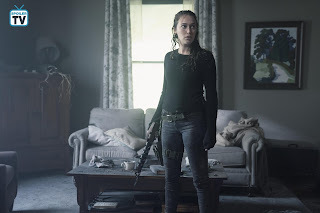 The character was trying to justify pulling the trigger, but what happened thanks to Debnam-Carey's masterful acting is that the audience saw Alicia for the first time come to terms with what happened to her family. She found peace in the middle of this chaos and with that peace came an inability to pull the trigger. When she opened her eyes again she let go of so many emotions and broke down right there in front of Charlie. Not only could she not pull the trigger, but her instinct was to latch onto Charlie's hand for dear life. At this moment Charlie was ironically her lifeline to her own humanity and she was clutching onto that for all it was worth. Through her body and face, Debnam-Carey conveyed so much of what was going on inside Alicia's head. In the most uncomfortable of environments and with emotionally draining material before her, Debnam-Carey rose to the occasion and delivered a scene that no one will be forgetting anytime soon. This was acting that can only be described as flawlessly perfect. After all of this emotionally draining material, the characters got a sliver of hope when Alicia heard something fall on the basement door. In an instant, Debnam-Carey took Alicia from a sobbing emotional mess back to her stoic heroic self as she dove under to retrieve her flashlight then charged at the door to try and force it open. She was clearly on a mission to save them both. Once they were out she had no problem shooting the undead man who had effectively saved them by falling on the door. Debnam-Carey chose to have Alicia very confident as she shot the man as opposed to how she had been moments earlier with Charlie. From this point on Debnam-Carey had Alicia acting very differently with Charlie, her acting choices allowed the energy between the characters to change to one that came across as more of a sisterly vibe. Somehow, in all this chaos, these two orphaned lost souls seemed to come together to craft a new familial bond. It is clear that not all is forgiven, but they have both chosen to move forward together for whatever comes next. The two characters shared a nice moment after the storm cleared and the actresses got to showcase the new dynamic between their characters. Their characters not only share a traumatic past of loss and betrayal but they now also share this triumphant act of survival that has forged a powerful bond between them. Debnam-Carey portrayed Alicia as more understanding and gentler with Charlie in stark contrast to the start of the episode. This was an ambitious arc that they had to bring full circle in the span of a single episode. It only worked because of these two actresses being able to work off each other so well. Alicia gave into Charlie's sentimentality and Charlie reassured Alicia that she does indeed carry her mother inside of her even if she can't see it herself. They are an unlikely duo, but they are a strong pair, both the characters and actresses. As they drive back towards where they left their friends, Alicia asks Charlie to close her eyes. Earlier, Charlie told her how she never made it visit the beach. So Alicia says she's going to take her there. Debnam-Carey does more than just deliver a lovely monologue here. She channels Kim Dickens in how she delivers it, in the cadence of her speech. She has Alicia look over at Charlie, coated in happiness and sunshine, and absorb some of that joy onto her own face. At that moment, you see Alicia take responsibility for Charlie. It's why she takes back the weapon she gifted Charlie with earlier and uses it herself to kill some undead they encounter. The very second that Alicia realizes this the audience does too. It's right as she finishes her story to Charlie about the ocean, as she gives Charlie exactly what was needed, despite insisting earlier that would never happen. Debnam-Carey has Alicia seem both weighed down and lifted up by pairing a reflexive smile at Charlie's joy with a wistful sadness in her eyes. It was a poignant way to complete their arc of reckoning and start them on a new journey together. This was an emotionally tense episode that relied entirely on Alycia Debnam-Carey carrying the entire episode on her shoulders. She and co-star Alexa Nisenson worked together to craft one of the most memorable and poignant episodes of this series. It was an episode about forgiveness against all odds and two lost souls finding hope in each other. Debnam-Carey carried the episode, but Nisenson gave her a lot of soulful heartbreaking acting to act against. These two proved a powerhouse duo and the writers were right to pair them up together for this episode. Debnam-Carey is one of those rare performers who somehow just manages to have chemistry with everyone. She knows what kind of connection a certain dynamic requires to work, and delivers on it. The beauty of the way this episode played out is the dynamic between Alicia and Charlie started off tense and adversarial, but it changed to one of understanding and unity. Through brilliant acting choices and suburb writing these two became an unlikely duo that learned to work together. Throughout her career so far, Debnam-Carey has delivered some very memorable performances. Her performance in this episode is one that would truly be worthy of Emmy recognition if the award show wasn't so afraid of genre shows. The episode was a defining one for her character and it was a defining one in the acting career of this profoundly gifted actress. All the reasons noted here, and many others are why Alicia Debnam-Carey was so worthily awarded the title of Spoiler TV Reader’s Choice Performer of the Month for August. She carried this entire episode and was in every scene, so it was impossible to cover every brilliant moment, so please use the comments section to discuss anything that may not have been covered.